Then, in 1997, he was a member of the Committee of Honour for the Bermuda Bowl on the first occasion that this was organized in an Arab Country, Tunisia. He competed in a truly transnational team (with French, German and Lebanese players) and finished 11th. Two years later, Omar was asked to join a French entry for the senior teams at the European Championships in Malta. Omar's team finished second. 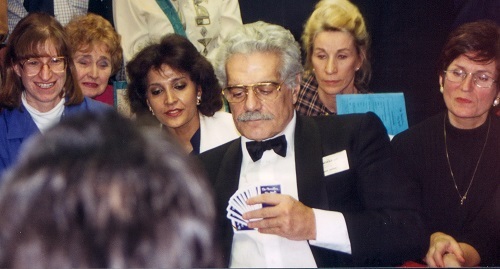 Another year later, at Maastricht, Omar Sharif joined Egypt's senior team, finishing in a creditable ninth place. The three French Senior teams in Malta finished in the first three positions and, as was customary at the time, this would mean the public would get to hear the 'Marseillaise' performed three times. The Organisers decided to play the theme to Doctor Zhivago instead, which was greeted with great cheers.